By default FileBoss displays its own popup menu when items are right-clicked. However if you prefer you can display the context menu used by Windows Explorer - and thus any shell plug-ins you have installed. 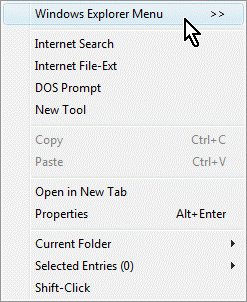 To display Explorer's context menu click the item at the top of FileBoss's menu. Once you have displayed the Windows Explorer context menu it will continue to be displayed whenever you right-click until you expressly display FileBoss's context menu as shown below. 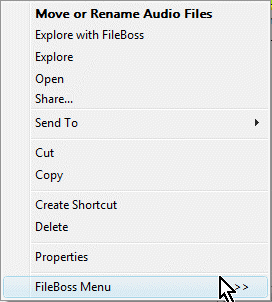 To redisplay FileBoss's context menu click the menu item at the bottom, FileBoss Menu. As before once you have displayed FileBoss's context menu it will continue to be displayed whenever you right-click until you expressly display Windows Explorer context menu as shown above.